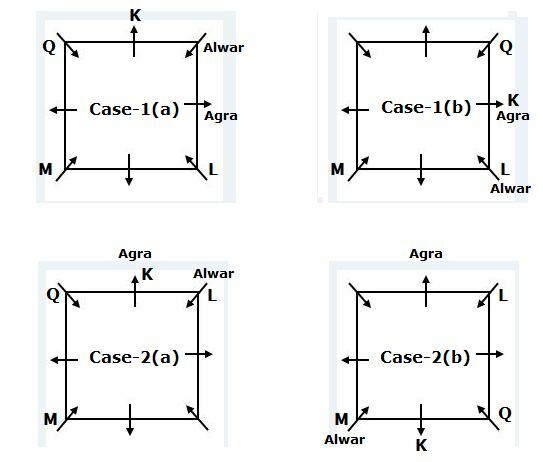 Eight persons J, K, L, M, N, O, P and Q are sitting in a square table in such a way that four of them are sitting in four corners and four of them are sitting at middle of the sides. The persons who are sitting at corners facing centre of the table and the persons sitting at middle of the sides are facing away from the centre of the table. They all are belongs to different cities of India viz., Leh, Patna, Pune, Alwar, Kochi, Agra, Salem and Bhuj but not necessary in the same order. The one who belongs to Salem sits to the immediate right of the one who belongs to Patna.Only two persons are sitting between the one who belongs to Agra and M, who does not sit at any of the middle of the sides. Q sits second to the right of the one who belongs to Alwar and both of them are not immediate neighbour of M. Q does not belong to Agra and sits immediate left of K. J sits opposite to the one who belongs to Kochi. O sits second to the left of the one who belongs to Kochi. K and N do not belong to Kochi. Only three persons are sitting between N and the one who belongs to Salem. As many persons sitting between P and the one who belongs to Bhuj is same as the persons sitting between the one who belongs to Leh and the person belongs to Bhuj. Q does not belong to Bhuj.L sits immediate right of the one who belongs to Agra. Only two persons are sitting between the one who belongs to Agra and M, who does not sit at any of the middle of the sides. L sits immediate right of the one who belongs to Agra. 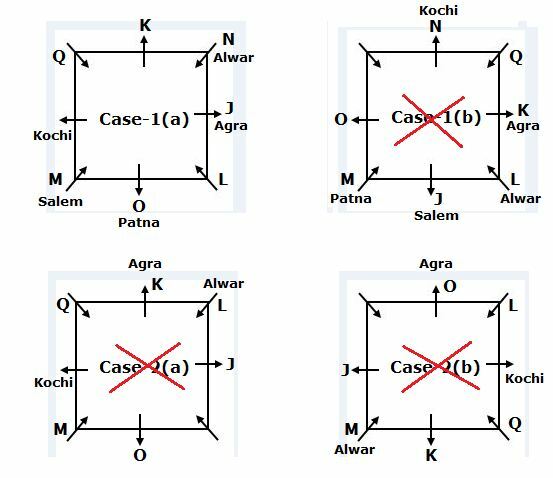 Q sits second to the right of the one who belongs to Alwar and both of them are not immediate neighbour of M. Q does not belong to Agra and sits immediate left of K.
J sits opposite to the one who belongs to Kochi. O sits second to the left of the one who belongs to Kochi. K and N do not belong to Kochi. The one who belongs to Salem sits to the immediate right of the one who belongs to Patna. Only three persons are sitting between N and the one who belongs to Salem. As many persons sitting between P and the one who belongs to Bhuj is same as the persons sitting between the one who belongs to Leh and the person belongs to Bhuj. Q does not belong to Bhuj. 3. 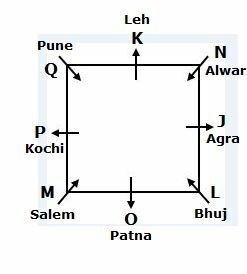 If K is related to Patna and L is related to Pune in a certain way. Then, P is related to which of the following? 4. How many persons are sitting between J and the one who belongs to Salem, when counted from right of J? 6. Which of the following elements is third to the left of ‘96’ in the Step III? The words are taken as in the dictionary order and the numbers are takes in descending order. In Step I, the letters are changed to next letter as in the English alphabetical series, in the Step II, the letters are changed to second next letter and so on till the last step. The number are multiplied with respect to the step number. 7. How many elements are there in between ‘18’ and ‘hkgnf’ in the step last but one? 8. Which of the following one is not in the last step? 9. If ‘96’ is related to ‘makes’ in Step II and ‘pdnhv’ is related to ‘116’ in Step IV in a certain way. Then ‘btwqi’ is related to which of the following in the last step? 10. Which of the following elements is exactly in between ‘116’ and ‘world’ in the Step III? 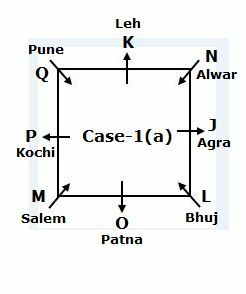 3) If K is related to Patna and L is related to Pune in a certain way. Then, P is related to which of the following? 4) How many persons are sitting between J and the one who belongs to Salem, when counted from right of J? 6) Which of the following elements is third to the left of ‘96’ in the Step III? 7) How many elements are there in between ‘18’ and ‘hkgnf’ in the step last but one? 8) Which of the following one is not in the last step? 9) If ‘96’ is related to ‘makes’ in Step II and ‘pdnhv’ is related to ‘116’ in Step IV in a certain way. Then ‘btwqi’ is related to which of the following in the last step? 10) Which of the following elements is exactly in between ‘116’ and ‘world’ in the Step III?